With Lawyers Guns & Money: Warren Zevon hold's FYM sonically captive, (this is our literal interpretation) as he describes an impressive tale of a US Diplomat down on his luck. Through the course of the tune, our imagination runs wildly along with Zevon's soaring guitar work, triumphantly unforgettable hook, as his unraveling archetype slowly becomes defiled. (this is our version of how it makes us feel) We like to think of Zevon's character as a James Bond-like runner, wealthy and despicable (yet still giving us the feel of a charming under-dog) it's a story that never seems to tire even after multiple listens. Warren Zevon also raises an important point, that enough of all three (Lawyers Guns & Money) can get one out of almost an sticky situation an FYM member could conceive of. 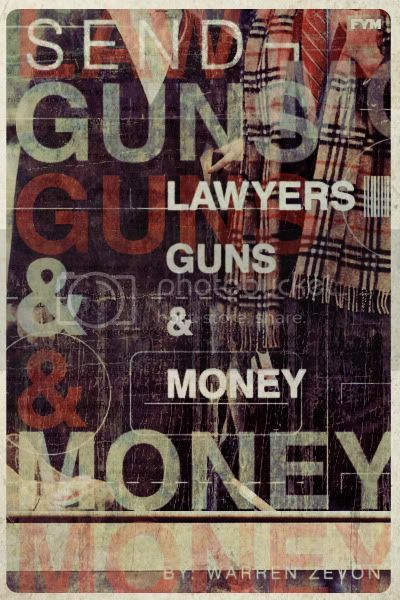 Lawyers Guns & Money closes possibly Zevon's greatest release 'Excitable Boy'. With other great tunes featured like: Werewolves of London, Roland the Headless Thompson Gunner, and Nighttime in the Switching Yard. It's indeed an FYM essential album.